If you have the queries or any confusion about TMJ disease then you are not alone. It is awful that diseases are deteriorating the health of people day by day. Sometimes due to the lack of knowledge about disease we don't get the proper treatment. TMJ (Temporomandibular joint) is the disorder related to the dysfunction of jaws and muscles which control the jaw movements. Ayurvedic treatment for TMJ disease involves the use of herbs which are completely safe and don't result any negative impacts on health. These herbs help to strengthen the muscles of jaw and also provide the relief in the pain associated with this problem. Temporomandibular joint and muscle disorders are commonly called as "TMJ," which result in the pain and dysfunction of jaw joints and muscles which are responsible to control the jaw movements. So it results in the severe pain and discomfort either on one or both sides of face. It has been found that this disorder is more common in women than men and mostly occurs among the people between the ages of 20 and 40. Let's see the symptoms of TMJ? Tenderness and pain in face, jaw joint area, ear area, pain when you speak, chew or open your mouth widely. Pain in neck and shoulders may also occur. Jaws get stuck or lock which causes the difficulty to open or close your mouth. Grating sounds, clicking, popping in the jaw joint when open or close mouth or chew. Difficulty in chewing or taking a bite if the upper and lower teeth don't fit proper. Swelling on the one or either both sides of your face. One may also have headache, toothache, dizziness, shoulder pain and hearing issues. Seek medical attention if you have persistent pain or tenderness in jaw and you are finding the difficulty to open or close your jaw completely. Then don't take it lightly and do visit your doctor. Long-term (chronic) clenching and grinding of teeth. 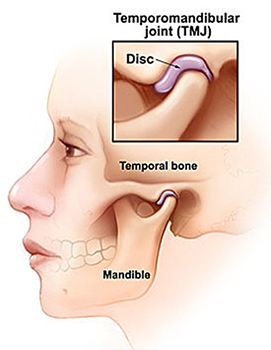 Certain connective tissue diseases which affect the temporomandibular joint. Poor posture of the neck and upper back muscles may lead to strain on neck and impairment of jaw muscle function. In Ayurveda it is believed that there are three energies vata, pittta and kapha in the body which are responsible for the good health. Imbalance in any of three energies result in the health issues. TMJ (Temporomandibular joint) is due to the imbalance of tridoshas but primarily vata dosha is involved. Vitiated vata dosha causes the obstruction in channels of face muscles which cause the hinderance in the jaw movements. It is called hanustambh in Ayurveda. There are various herbs present in ayurveda which are quite beneficial for the treatment of TMJ. Herbs like Ashwagandha (Withania somnifera), Brahmi (Bacopa monnieri), Turmeric (Curcuma longa), Guggul (Comniphora mukul), Karpoor (Cinnamomum camphora), Danti (Baliospermum montanum), Mustak (Cyprus rotundus), Haridra (Curcuma longa), Amalaki (Emblica officinalis) help to strengthen the muscles of jaw joints and also provide the relief in the pain associated with this problem. 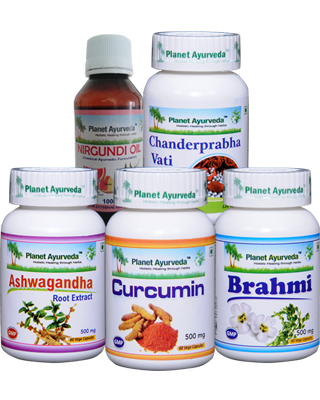 Planet Ayurveda's herbal products are prepared from the pure extracts of herbs and free from any preservatives, chemicals, colors and starch. Thus these products are completely safe for use without any adverse effects on health. Planet Ayurveda's Ayurvedic treatment for TMJ disease includes ashwagandha capsules. These capsules are prepared from the pure extracts of herb Withania somnifera(Ashwagandha). This herb is packed with the amazing properties and quite effective for the treatment of TMJ (Temporomandibular joint). Ashwagandha helps to provides relief in the symptoms associated with TMJ like swelling and pain in face. Dose: 2 Capsules twice daily, with plain water, after meals. Brahmi capsules are also an amazing formulation of Planet Ayurveda for the treatment of TMJ. These capsules are prepared from the pure extracts of herb Brahmi (Bacopa monnieri). This herb has the great medicinal importance and also good for the treatment of TMJ. It helps to provide relief in the symptoms associated with TMJ like pain in face or jaw area, ear area, pain when you speak and difficulty in chewing or opening your mouth widely. Dose: 2 Capsules twice daily after meal with plain water. 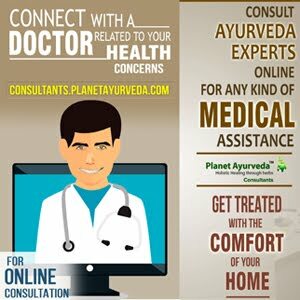 Planet Ayurveda's curcumin capsules are an effective Ayurvedic treatment for TMJ. These capsules are 100 % pure and prepared from the pure extracts of herbs Haridra (Curcuma longa). This herb is packed with a phytochemical compound, curcumin which has the anti-inflammatory properties. Thus these capsules help to reduce the pain and stiffness thus good for the treatment of TMJ. Benefits: Herbs explained above are packed with the amazing properties and help to strengthen the muscles and also help to improve the jaw movements and provide the relief in pain also. Thus Chanderprabha vati is an effective Ayurvedic treatment for TMJ disease. Benefits: This herbal oil has the anti inflammatory properties and also helps to strengthen the muscles of face. Thus it is a good ayurvedic treatment for TMJ disease. Dosage: For local application only. when I open my mouth its create sound due ti Jaw disorder. Please suggest me medicine to permanantly resolved it.